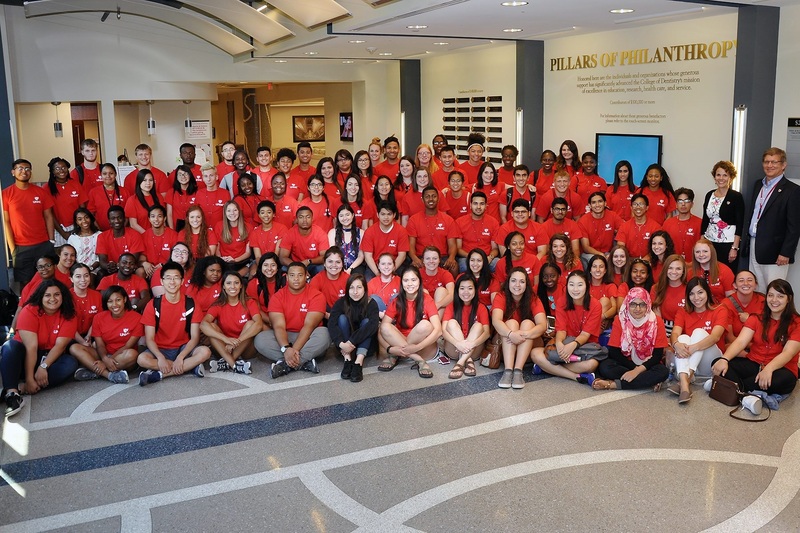 The Summer Health Professions Education Program (SHPEP) at the University Nebraska Medical Center (UNMC) offers a dynamic and interdisciplinary academic enrichment experience that emphasizes a global approach to learning. Our cross-cutting interprofessional curriculum is comprised of faculty and staff from the UNMC Colleges of Medicine, Dentistry, Nursing, Public Health, and Allied Health Professions (Physician Assistant). We strive to graduate confident and proud SHPEP Scholars’ ready to pursue their educational goals and dreams. Our six week program is focused around essential competences required of successful health professionals of tomorrow, who will be tasked with assuring health equity and delivering culturally and linguistically competent health care services. Critical elements of the UNMC SHPEP curriculum include a broad spectrum of resilience and personal health and wellness promotion, fostering self-care practices, problem solving, time-, and financial management, and study skills. UNMC SHPEP Scholars are involved in a wide range of academic enrichment activities in the basic and social sciences, and interactive workshops aimed at strengthening students’ research and inquiry skills. Multiple career development sessions are intentionally distributed across all of the represented disciplines and will be used to direct scholars towards the exploration of various health professions, demystifying the admissions process, and the development of individualized education plans. The University Nebraska Medical Center is committed to growing a diverse and passionate health professions workforce. We strongly encourage students from underrepresented and divergent backgrounds to apply. Clinical Experience: Scholars are provided opportunities to shadow healthcare providers in an array of settings at the University of Nebraska Medical Center, Nebraska Medicine, local agencies, clinics and hospitals in the metropolitan area. UNMC SHPEP Scholars are also given the opportunity to learn and practice hands-on skills in simulated environments in the state of the art Interprofessional Experiential Center for Enduring Learning (iEXCEL). Meals: Our SHPEP Scholars are provided three meals a day throughout their time with us. Breakfast, dinner, and most weekend meals, are served at the Scott Campus dining hall. For lunch, scholars receive meal tickets redeemable at any of our one of a kind campus cafes. A common and popular campus lunch destination, the Nebraska Café at University Tower offers a remarkable selection of healthy food choices. For meals away from campus we make every effort to meet the needs of dietary restrictions that we are aware of. Travel Assistance: Scholars are given a travel stipend to assist with the cost of travel to/from Omaha. The travel stipend provides for round-trip coach airfare paid up to $500 or car travel up to $500 for those traveling more than 50 miles to Omaha. Upon arrival to and departure from Omaha we provide free shuttle service to and from the airport. Stipend: The UNMC SHPEP program will provide a $600 stipend distributed in three installments ($200 at the end of the ﬁrst week, $200 at the end of the third week, and $200 at the end of the sixth week). Housing: SHPEP scholars at UNMC reside in Scott Crossing located on the University of Nebraska Omaha (UNO) campus. All rooms are suites that contain a shower, a vanity with double sink, and a twin-sized bed, bureau, desk, and chair for each occupant (4) in a private bedroom within the suite. A common living area with a sink, microwave oven, and refrigerator as well as love seat and chair is also part of each suite. The 4 occupants share a bathroom. Weekly house-keeping and linen/towel service is provided. SHPEP scholars have unlimited access to a ﬁtness room, study lounges with computers and TVs, multimedia Room for gaming and movies, and coin-operated laundry facilities within the building. Movie rentals, cooking facilities, and other amenities are also available. Seven UNMC students serve as resident assistants and live in the residence halls with SHPEP scholars. Health Insurance: Scholars must provide proof of health insurance. A short-term policy can be purchased that will provide coverage for the duration of the program. Social Activities: Throughout their time with us SHPEP Scholars are involved in a wide range of unique and exciting social activities both on and off campus. You will visit and explore a number of greater Omaha area attractions and events. We will take you out for some Shinrin-Yoku (forest bathing) at Fontanelle Forest, invite you to attend fireside chats with thought leaders, challenge you to participate in our talent show, and so much more!